Eighty Mile Beach, also spelt Eighty-mile Beach or 80-mile Beach, lies along the north-west coast of Western Australia about half-way between the towns of Broome and Port Hedland. It is a beach some 220 kilometres (140 mi) in length, forming the coastline where the Great Sandy Desert approaches the Indian Ocean. It is one of the most important sites for migratory shorebirds, or waders, in Australia, and is recognised as a wetland of international importance under the Ramsar Convention on Wetlands. Would you like to enter your own description & more? It's free, click HERE. Eighty Mile Beach is south of Broome and I would highly recommend that you spend a few nights at this beautiful spot. It is easily accessed down a well maintained dirt road - turn off the Great Northern Highway and follow the signs. On arrival at Eighty Mile Beach Caravan Park, we quickly parked the caravan and walked to the beach for a look before dark (the sun setting over the water is quite amazing). The beach stretches as far as you can see in either direction and we thought it was low tide as the ocean seemed quite a long way out. Next morning we realised we were mistaken as the water was a further 300 metres away - it was now low tide. 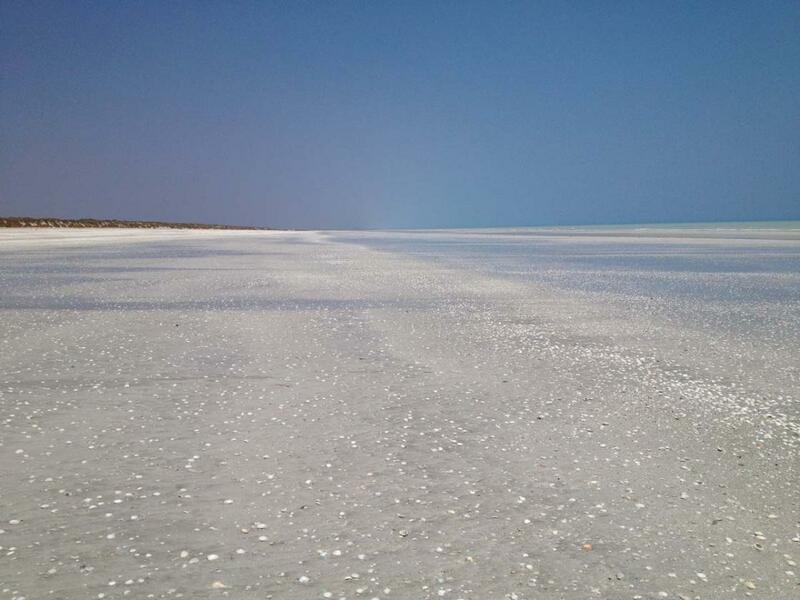 Eighty Mile Beach is full of shells and you need to wear thongs all the time as they crunch underfoot. This a great place to try some fishing - either straight out from the Caravan Park or drive along the beach to find that perfect spot. have you been to Eighty Mile Beach? Join us and add your comments and tips. Explore Eighty Mile Beach with RvTrips and find out where to stay, what to do and what to see. Helping caravan, motorhome and camper owners have a great holiday.